Are you planning a birthday party, social get-together or corporate day out? Looking for something different and exciting to do? What better way to socialise than with an entertaining and absorbing game of croquet? At Sydenham Croquet Club we are keen to make our facilities available to the surrounding community and our lawn is now available for private hire on Monday, Tuesday, Thursday and Friday from April to the end of September for a one-off event or regular weekly or monthly sessions. Croquet is easy to play, has simple rules, is fun for all ages and abilities and is a entertaining way to spend a summer’s afternoon. As well as offering a well-maintained lawn we can provide croquet equipment, including balls and a good range of mallets to suit all sizes, and guidance on how to play. 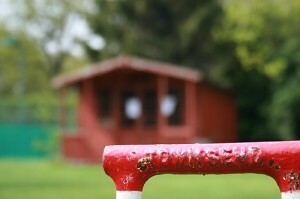 We also have a croquet chalet with tea-making facilities.